Image by Terry Moran in the Londonist flickr pool. The World Cup begins on 12 June, and runs right through until the 13 July final. 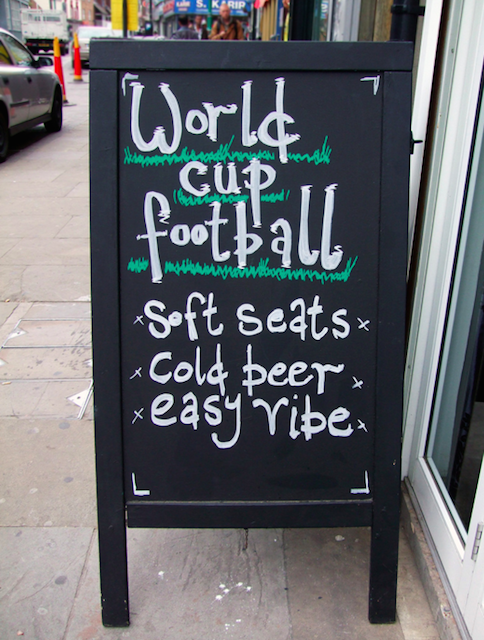 Regardless of which nation you're supporting, there's somewhere in London to watch those all important matches. Note: pre-booking might be required with some venues, and there may be a charge for some events, so check with individual venues to avoid disappointment. Our tips on finding the best nation-specific atmosphere. If your country isn't listed, we haven't found anywhere specifically screening the matches. If you know better, let us know in the comments below and we'll add it to the list. We'll be adding venues to this list throughout the World Cup, so keep checking back. AUSTRALIA: Predictably, Walkabout in Temple is screening matches — indeed, every single match — and will be no doubt be home to a big, boisterous Aussie crowd. BELGIUM: Leon De Bruxelles on Cambridge Square is offering strong support for the Belgian team, with drinks offers to accompany screenings of the matches. There is also a foosball tournament going on, with a £30 entry fee per team which will be donated to the Cavell Nurses' Trust. You need to register to take part. BRAZIL: As the host country of the competition, Brazilian venues in London are predictably doing the World Cup in style. Guanabara in Holborn will screen every Brazil match and most England matches, plus entertainment from samba dancers and capoeira performers. Earlybird tickets (£5) are selling fast, general tickets are £10, pre-booking essential. Floripa in Shoreditch is showing matches, although some will be shown silently while other events are taking place (pre-booking recommended). Cocobamboo in Chalk Farm is also offering prizes, including free shots for every score and a chance to win a trip to the winning country. Boteco Brasil Soho has paired each screening with a culinary experience as well as art, music, fashion, design and photography performances and exhibitions. Tickets need to be bought in advance. COLOMBIA: Leños y Carbón Colombian restaurant in Elephant and Castle is screening World Cup matches. ENGLAND: Polo Bar on Bishopsgate is a stereotypical English cafe, and has just undergone a refurbishment to include a new private bar, 'Phil’s Office', which can be booked out in advance for £300 per match, including 20 beers and half time snacks. Contact to prebook. Or head to Shakespeare's Head on Carnaby Street for these matches. Just about any other pub in London with a screen will also be in on the act. FRANCE: A group of French ex-pats in London have gone to the trouble of booking out space for 1,200 people to watch the matches atLondon’s biggest screen in the Clapham Grand. There will also be French food and activities. Find more information and book your place here. It's been suggested that Le Pot Lyonnaise is showing France games, but we haven't had this confirmed. Why not show your support by trying out these French restaurants in London? GERMANY: Bavarian Beerhouse in Old Street and Tower Hill is showing all Germany matches (£10) and some England matches too. Octoberfest Pub in Fulham will also show all England and Germany matches. Alternatively, check out these German food and drink outlets to get into the spirit. IRAN: Catch the Iran vs. Argentina match on 21 June at Hollywood Arms and help to raise money for The Popli Khalatbari Charitable Foundation. £20, prebook. ITALY: Bunga Bunga Italian bar and pizzeria in Battersea will screen all Italy and England matches. JAPAN: We don't know of anywhere that's showing Japan matches specifically, so why not show your support by trying out these Japanese bars or Japanese restaurants in London? MEXICO: Mestizo in Euston is showing Mexico matches with taco and beer nights. El Paso Mexican restaurant and cafe in Hoxton will be showing all games in the ground floor bar and basement area. We reckon these tequila and mezcal bars might also be a good option too. NETHERLANDS: De Hems Dutch Cafe Bar in Soho hasn't confirmed whether it will be screening matches, but it's a well-known hangout amongst Dutch ex-pats in London. PORTUGAL: The Fishermans Arms on Old Oak Lane in Willesden Junction (NW10 6UB) is showing Portuguese matches on three big screens. The pub has access to British and Portuguese TV channels so will broadcast depending which language is most in demand. RUSSIA: Erebuni, a Russian-Armenian restaurant near Barbican will be showing all games on a big screen. SPAIN: La Tasca's bars and restaurants in Broadgate and Covent Garden are showing all Spain and England matches, beginning with Spain vs. Holland on 13 June. Free but pre-book. Alternatively, try these Spanish restaurants in London. USA: Earlham Street Clubhouse in Covent Garden gives Londoners a chance to watch the World Cup in East Coast American-style settings. Every game will be screened, and although you can just walk in, booking is recommended. See here for more details on the food deals on offer. Steam and Rye in the City is offering screenings of all matches in the restaurant (some silent screenings), and have private rooms available to hire for 30-100 people (prebook). Alternatively, try out these American-style eateries. TRAFALGAR SQUARE: To kick the World Cup off (no pun intended), the Brazilian Embassy is holding Brazil Day in Trafalgar Square on 12 June, with live music, samba dancing, a food market, football zone and a carnival atmosphere. ANGEL: Old Red Lion Theatre Pub in Angel has several World Cup events going on, including comedy commentary screenings, a Panini sticker swapping event and a World Cup Photography Exhibition. More information here. BRIXTON: Whirled Cinema in Brixton is hosting its own Whirled Cup, with 28 matches being screened, as well as classic football films and documentaries, ultimate goal compilations, a Fifa14 video game tournament, craft beer and BBQ. Tickets are £6 and must be prebooked. ELEPHANT AND CASTLE: Ministry of Sound is screening England's first game on a giant screen in the courtyard, with an outside bar, hog roast and live music. Prebook. HOLBORN: Bounce moves over from ping pong to football for a series of free world cup screenings, but you must register in advance. KENSAL RISE: Parlour in Kensal Rise will be showing every match on the big screen, and staying open late for all England matches. OLD STREET: Trapeze Bar in Great Eastern Street is giving people the chance to prebook private screenings of matches, plus there's a special World Cup launch party on 12 June. SHOREDITCH: There's free entry to Cargo on Rivington Street for all matches, with the action projected onto five large screens. Meanwhile, in Rich Mix, Football fans can watch every single match for free in the bar, or pay £35 for the VIP experience — watch from the Mezzanine Gallery and sample a range of authentic cuisine and Brazilian cocktails. SOHO: Zebrano cocktail bars are screening all matches and offering menus from each country as accompaniment. We'd recommend booking, as central locations such as this are likely to get very busy when matches are on. WATERLOO: The Vaults in Waterloo is having a World Cup Carnival, with tickets to each match from £8 — needs to be booked in advance. And, of course, pretty much every pub and bar with a screen will be showing some or all of the games, if you can't get into one of these parties.